After two weeks of going through photos, editing and organizing, I finally have a few shower photos to share! My shower was two weeks ago at a very rustic waterfront location in New Bedford. The place was gorgeous with rock walls and wooden beams. All of the details were perfect. From colors and fabric to food and finishing touches. My sister, best friend, Mom and Aunt-In Law threw it for us. All of them collaborating made for an amazing and extremely personal shower. 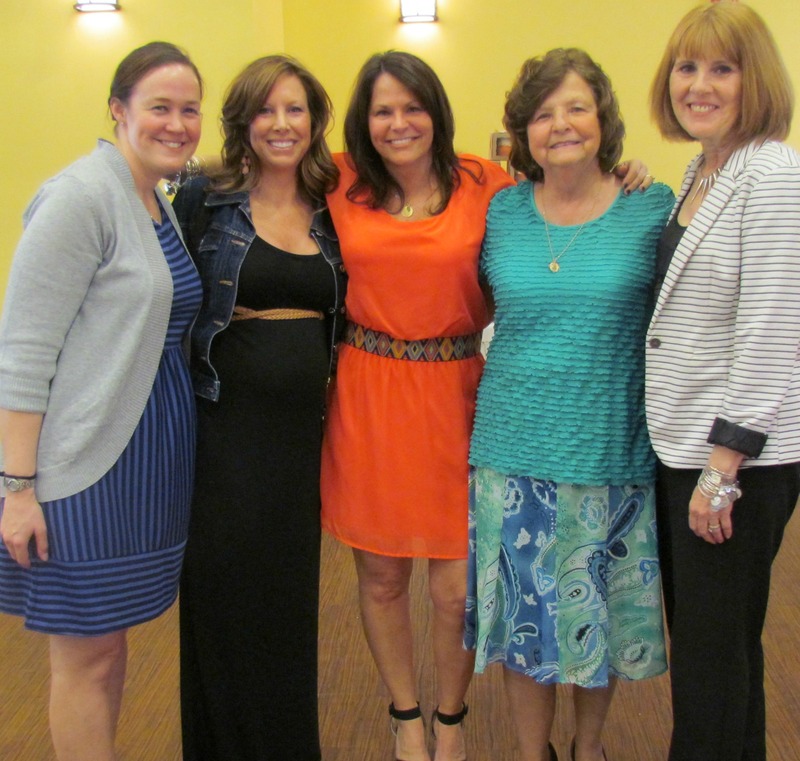 From left to right, My bestfriend Amy, me, my other bff/sister Deb, my Mom and my hub's Aunt! My hubs made a clothes rack for all of the outfits to be hung on! This is my daughter's best friend, Abigale. She doesn't know it yet. 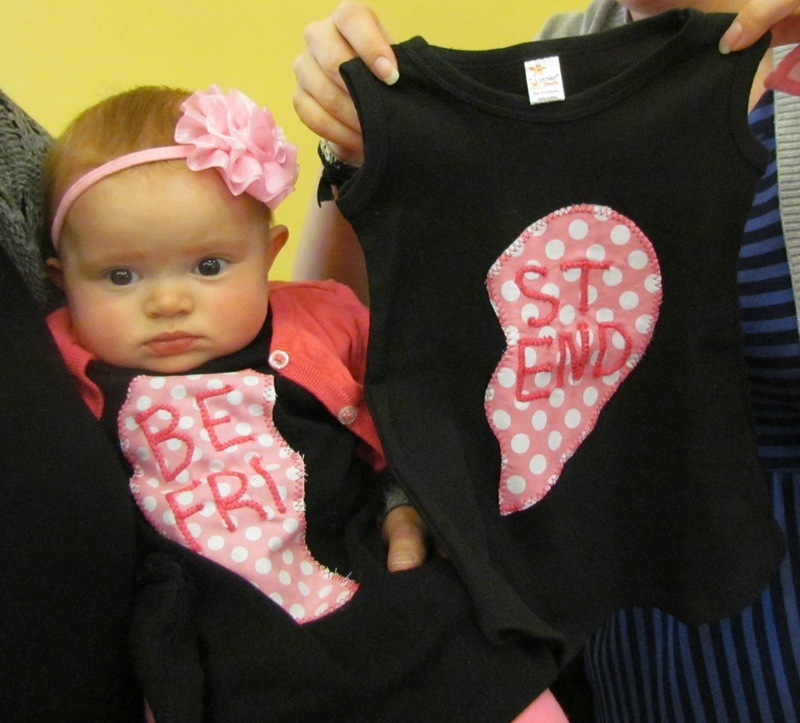 Abi's mom had BFF t's made for her and Baby Casey. Pink cupcakes with butter cream frosting topped with tiny edible pink pearls for the adults and little rocking horses, feet and baby carriage lollipops for the kids to take home. Baby Casey will have enough clothes for the first 3 months with out having to do laundry! 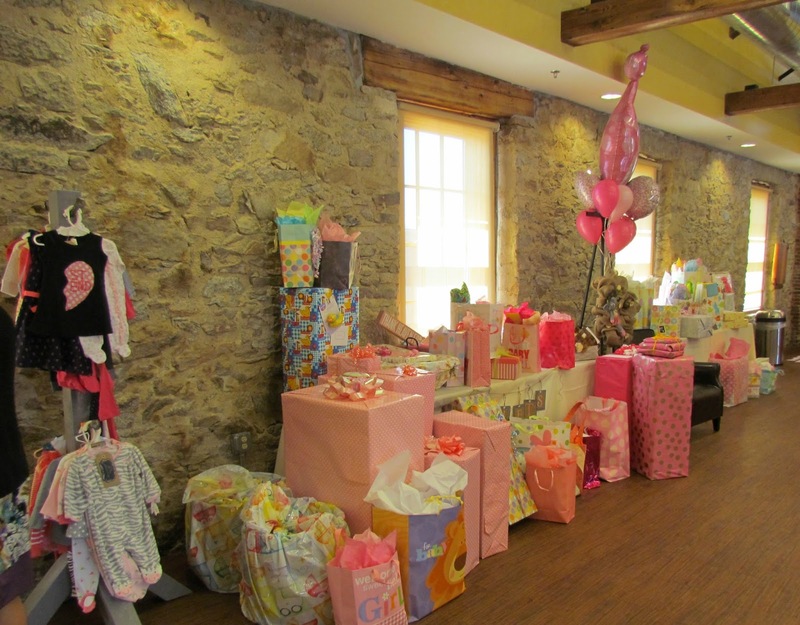 We had 60 guests attend and all of our family and friends were so generous. 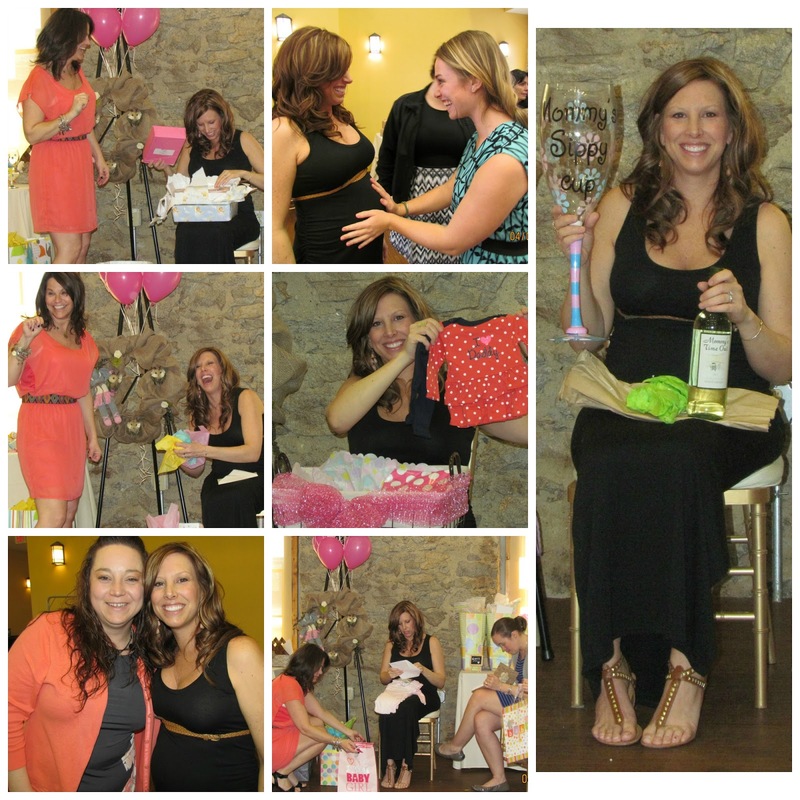 There were a lot of laughs, belly rubs and just about everybody asking what our baby girl's name is going to be! And shame on my mother for buying me wine accompanied by the biggest goblet ever, knowing that I will not be able to enjoy it for another 9 weeks and 4 days! Because my "nesting" mode has been in full effect, all of our gifts were organized and put away by Monday afternoon. Now we just sit and wait patiently for her arrival.....or start to refinish your bedroom set, as I did this weekend. Pictures coming soon along with a finished nursery update. Love! Glad you had such a great time! Love the dress too. Great pick! Beautiful shower!! 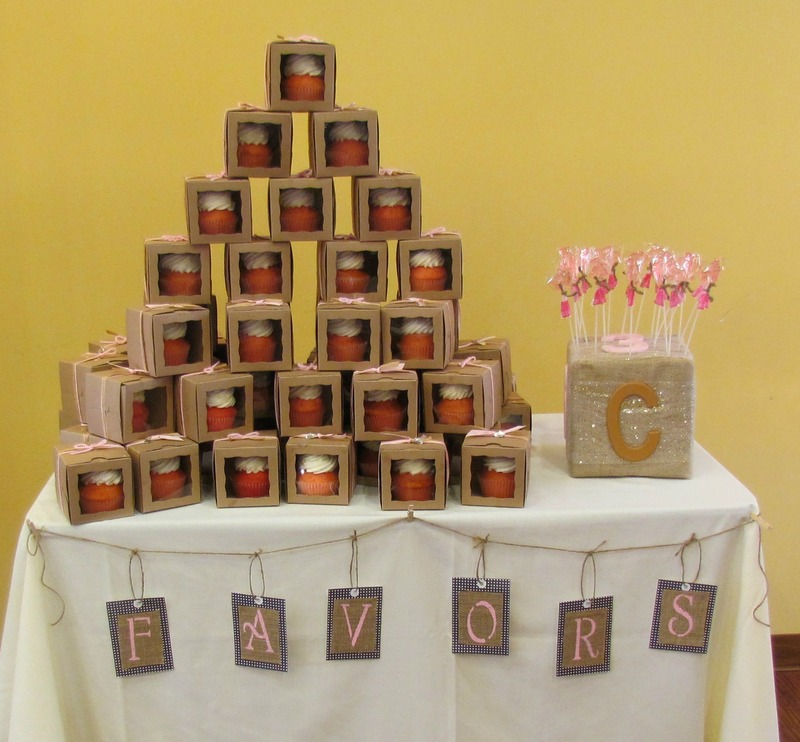 I love the cupcake favors--so cute! Congrats mamma! Enjoy that baby!! Amazing pictures Jess, you are one hot momma! Looks like everyone had a great time. We miss you guys! 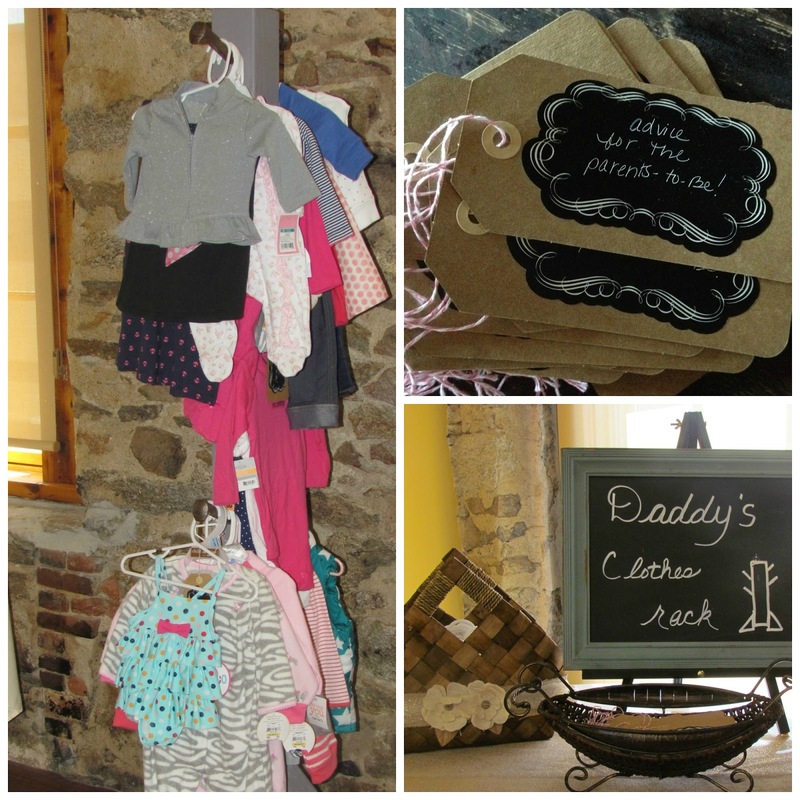 What a generous shower you had - and I love the clothes rack hubby made! Beautiful shower. You look amazing too and that sippy cup for mommy is the best! LOVE the BFF shirt!! Soo cute!!! Everything looks perfect! I love all of the little details, but I think that "BEST FRIEND" shirt has to be my favorite thing! Way too cute! Looks like a great shower and you looked so cute! That wine goblet is perfect!! Haha! That best friend shirt is beyond adorable!!! What a great shower! 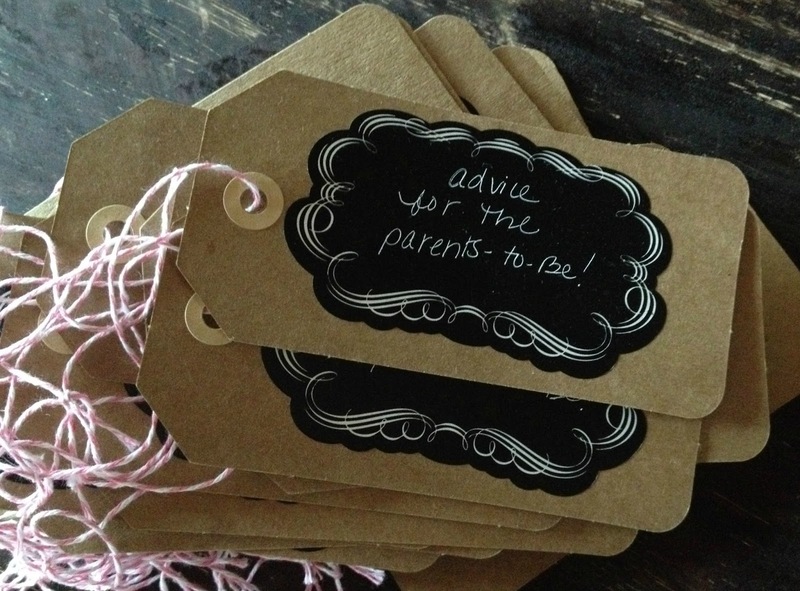 Thanks a ton dear for sharing these baby shower details! I am so pleased to read this post. 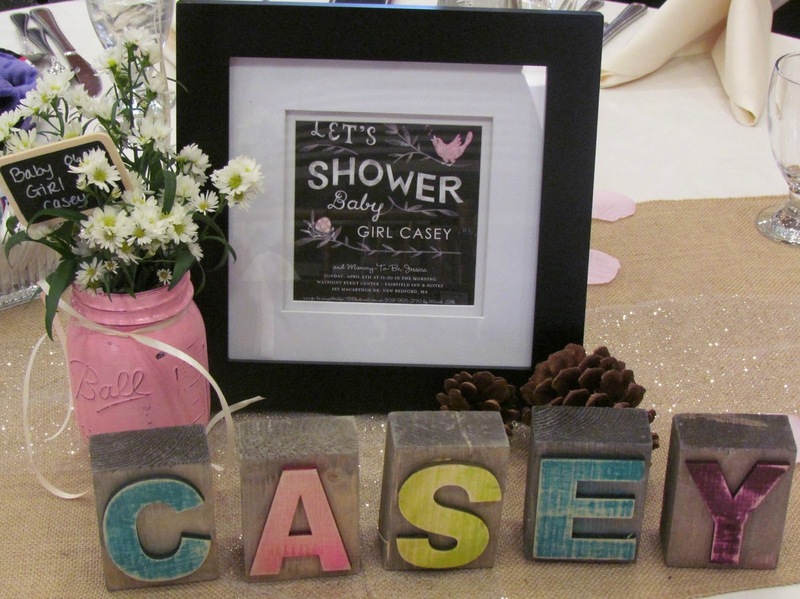 I have also been thinking to plan a baby shower for my sister at best Venues in NYC. Can you please help me with some planning ideas?